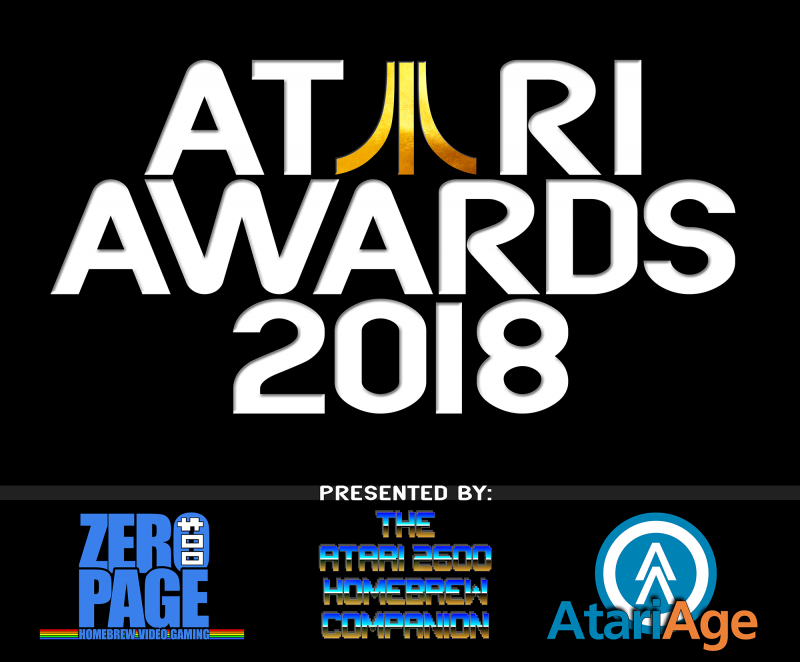 The 2018 edition of the Atari Awards, celebrating the best in Atari 2600 Homebrew, will take place LIVE on the ZeroPage Homebrew's Twitch channel on February 23rd, 2019 at 12PM PT | 3PM ET | 8PM GMT! YOU GET TO VOTE starting January 23, 2019 for your favorite homebrews, hacks and demos when we reveal the final nominees in each of the categories below. After the voting closes on February 18, 2019 and your votes are tallied, the 2018 Atari Awards will be broadcast LIVE on February 23, 2019 to announce the winners and give out the awards! Please feel free to suggest and discuss below all your favorite homebrew games that you think should be nominated for an award for 2018! Edited by cimmerian, Tue Jan 8, 2019 12:21 AM. Yeah, this was my idea while writing The Atari 2600 2018: Year in Review Homebrew Companion book, seeing that the last Homebrew Awards was back in 2004. I wanted to create a new one since the homebrew community is the busiest its been in a long time! So this is a call out to all you homebrew gamers out there!!! Let's hear your suggestions! Edited by Arenafoot, Wed Sep 12, 2018 12:05 AM. A lot of people will not know about the exact release dates. Therefore I suggest that someone compiles a (hint) list of the games which can be voted for. Edited by Thomas Jentzsch, Wed Sep 12, 2018 12:38 AM. A lot of people will not know about the exactly release dates. Therefore I suggest that someone compiles a (hint) list of the games which can be voted for. Will do! I have a running list of ROM file names that were released throughout this year, so it should be easy enough to clean it up a bit and post that info! Edited by cimmerian, Wed Sep 12, 2018 12:49 AM. Perhaps a "Best From 2005 - 2017" category to give shot to all the games released in the years that have past since the last awards? I figure that gives a fair shake to all those games which won't be included in the 2018 awards as well. Cool! Yea a list would help. This should be a lot of fun! Great idea. Would there be a separate category for things like Bb homebrew and Assembly? Excellent idea! Will there be a category for "best music", or "best original music", or will this be lumped in with "best sound"? "Best label art" would also be a good category. Nice Idea! Will be interesting to see a list as i missed most homebrews released in the first half of 2018. IMO we shouldn't create too many categories before we know how many people are participating. Else the result might become random. YES! Finally someone has picked this up again and ran with it. I had SO much fun doing the old Stan Awards! Of course, back then the pool of nominees was MUCH smaller! Can't wait for this! are these for finished releases only, or anything that comes out during the time period? Maybe a "Best/Most Intriguing WIP" category would be appropriate as well? We don't want to be overloaded with too many categories but it's truly surprising how many games have been worked on or finished so far in 2018! We are definitely looking for more possible categories before we finalize and release the category list. Keep the suggestions coming for categories and games, we don't want to leave any out. That might be a tad overwhelming with the sheer number of games that were released during that time but we'll take it into consideration! And winning becomes less of an accomplishment when there is an award for everything given out to nearly anyone. I think all games should be judged on an even playing field that doesn't seperate between ASM or Bb. If you programed in ASM or Bb doesn't matter, you are in the same group. A game for the 2600 is a game for the 2600. Doesn't matter what tools where used to code it in such a case. But the recent spate of coprocessors on the cartridge is definitely Not a level playing field. You can't fairly compare a game with an on board high speed Arm chip doing bus stuffing and other computational assists to a vanilla game limited to just the 6507 and what it can do. Those should be two distinct categories at least. Maybe add game categories. Best platformer, best racer, arcade game, etc. Its hard to compare some categories, especially as not everybody likes everything. Hi guys, that’s a super cool initiative and a great motivation to anyone who wants to not only start some project but specially to make a release out of it. I’ve started one project a few months ago, and I’m wondering what is the path or directives to get a game released, or maybe simply to be considered in a discussion list, or even how do I get collaboration somehow in this process. Is there a specific thread for this discussions or I should simply to create a new topic and start publishing my roms. I’m really exited into getting involved with the community from now on but I’m quite newbie in this one to be honest. Any recommendation would be appreciated. Thanks!